Iran is forcing 10 Jews to join a group to Lebanon for the planned Global March on Jerusalem despite dangers of terrorist kidnappings. Iran is forcing 10 Jews to join a group headed to Lebanon for the planned Global March on Jerusalem, despite dangers of terrorist kidnappings, according to DEBKAfile. The Islamic Republic is heavily funding the march and flying people from Asian countries to Iran and then to Lebanon. Iranian sources told the website, managed in part by former intelligence officials, that the event’s organizers ordered the Jewish community, estimated at between 15,000 and 25,000 people, to send 10 people to march along Muslims in Lebanon. Ten Jews, by coincidence or not, is the number required for public prayer. The Iranian leaders of the march reportedly ordered that the Jews, from ages 18 to 22, will have the “honor” of leading the march, which would make them even more vulnerable to Hizbullah and Palestinian Authority-allied terrorists in Lebanon. The Beirut government is dominated by pro-Syrian parties and Hizbullah, which in effect governs the southern part of the country from the Litani River to the border with Israel. Supreme Leader Ayatollah Ali Khamenei two months ago declared that the Global March is consistent with Iran’s resistance operations” against Israel. 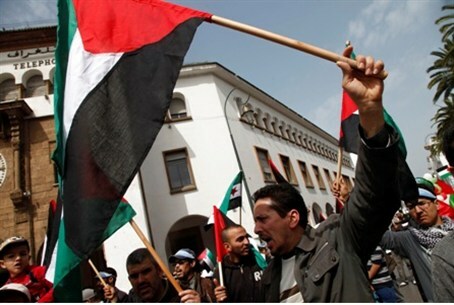 The Global March is being staged In Lebanon and Jordan as another ploy to drum up international supports for the Palestinian Authority (PA) demand for unilateral recognition of PA territorial and political demands following the demise of the Oslo Accords and of the ensuing diplomatic process towards negotiations with Israel for the establishment of the PA as an independent entity. Previous “million-man” marches have fizzled with few participants, but the Jordanian and Lebanese governments have offered more support this time around. Israel has warned them not to try cross the international borders. The signatures included that of a Jewish member of Parliament and rabbi who was described as the chief Jewish cleric in Iran.